Announcing the winners of the 11th Right Place Photo Caption Contest of Season Two! -- "Ohhh, please, please, please, please make my pee-pee bigger! Oh, please, please, please, please!" -- Venezuelan President Hugo Chavez participates in a demonstration at the U.N. Petty Tyrants Tantric Yoga Club. -- "Oh, please, let my listeners here be as gullible as they are at home!" -- "Don't let the Americans drill for oil in Alaska or in the Gulf of Mexico. I need all the oil revenue I can get." -- "And for Christmas, I want some missiles from North Korea and nukes from Iran..."
-- "And finally, Lord, let the next Secretary General of the U.N. be as easy on us as Kofi. Maybe Bill Clinton would take the job?" -- "Thank you, Lord, for giving me all of these gullible people in the U.N. and the media." -- Hugo Chavez takes a moment from his busy schedule to show Nancy Pelosi how one is supposed to hold one's hands when one wants to fake praying. -- The Great Leader said religion is the opiate of the masses. Hugo Chavez gave it a try and decided to stick with blow. -- "...And bless Fidel, and Osama, and Kofi, oh, and pleeeease don't let the peasants find out about the billions I stole from them." "...And lastly, please let me get a new chihuahua puppy for my birthday. Amen." -- "Muchas Gracias, Dios, for making Tom Harkin understand me." -- "El estimado Dios, recuerda que Ahmadinejad es peor que soy." -- "Dear God: The backdrop at the U.N. really needs to be changed. This green marble is ugly!" -- "Come back, Cindy, and I will make you my Queen. We will live in grandeur and rule with an iron fist in the squalor that is... Venezuela. Plus, the chili's not bad." -- "Scotty, don't tell me, 'It isn't working' - I need you to beam me up NOW." -- "...And please let me have a John Bolton mustache ride. Amen." -- "Oh, Lord, I have spoken to the U.N., faced off the Great Satan, and befriended poor humble Castro, now please make J-Lo my wife as you promised." -- "Dear God... Please do not smite my sorry a**." -- "Ummmmm... That light coming down here... is that lightning?" -- "...And I'd like a bicycle, and a baseball glove, and a fire engine..."
-- "Ia! Shub-Niggurath! Black goat of the woods with a thousand young!" -- "Please give me big, monstrous hooters like Christina Aguilera." -- "...And please, God, I promise to stop exporting socialist revolution if You'll stop my head from turning into a basketball." -- Now all we need are the handcuffs. -- "...And I want a pony, and a slinky..."
-- After seeing Helen Thomas raise her hand to ask a question, Chavez prays for invisibility. -- "Dear Allah... I mean God... thank you for creating me as El Diablo! 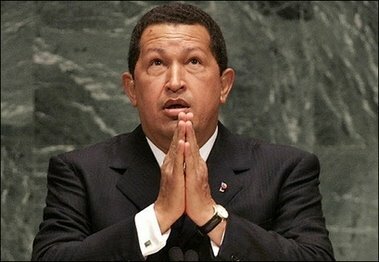 Just don't let the world know..."
#9: Hugo Chavez prays that his newest, bestest friends, the Islamofacist jihadists, don't pick today to nuke New York. #8: "Dear God: Please don't let a U.S. cruise missle fly up my a**!" #7: Bolton thinks to himself: "I can't believe Hugo fell for that old 'the U.N. lights all have a *clapper* switch' gag!" #5: "Please don't let the price of oil fall below $60 a barrel." #4: Since he was praying for global socialist revolution, the ACLU gave him a pass. #3: "...And please, Dear, Sweet Jesus, let someone introduce Cindy Sheehan to the concepts of soap, deodorant, and Jenny Craig before she comes around to Caracas again." #1: "...And please, God, place a Citgo on every corner of the Devil's Kingdom!" Chomsky, can you hear me? Chomsky, can you see me? Chomsky, can you help me crush the Right? Chomsky, are you near me? Chomsky, can you help me not be frightened? Chomsky, don't you know I had no choice? Even though the Right is filled with voices?